Why an error always occur when i installed the packages? 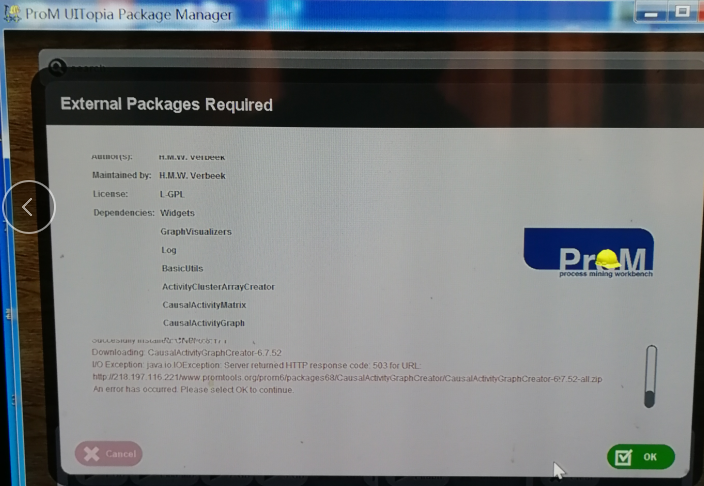 When I use the Package Manager to install the package, I always get an error, let me choose the OK button to end the installation.Then, after opening the PROM, import XES or other file format, "no import plugins avaliable" will appear.I tried various versions of the prom and tried both windows10 and windows7, and changed different computers, but the same problem still occurred.I installed it strictly in accordance with the installation instructions of the prom, my installation order should be no problem.So, I really don't know how to solve this problem.I really hope to get help.Thank you very much. Is it always the same package that causes the problem? Or is it always the first package it is trying to install? Does any package install successfully? What happens if you try to access the given URL (http://www.promtools.org/prom6/packages68/CausalActivityGraphCreator/CausalActivityGraphCreator-6.7.52-all.zip) from your favorite browser? Does that work? If not, the server might just block you. For your suggestion, i can access the given URL, and i downloaded the compressed package automatically, but I don't know how to use it. In addition, all packages installation occurred the same problem, not the same package and not the first package. Can you give me some more advice? I guess that at some point, your connection to our server breaks down for some reason. Could be some congestion somewhere down the line. Perhaps better take install the packages using a piece-meal approach. Instead of trying to install many packages at once by installing the umbrella package RunnerUpPackages, try to install a few packages every time. If you know which packages you need, you can try to install only these packages. Which plug-ins do you want to run? You can then have a look at https://svn.win.tue.nl/trac/prom/wiki/ProM68/Plugins to see in which package the plug-ins are contained, and install only these packages. ProM will then use a package repository in Brisbane, Australia, instead of the default repository in Eindhoven, The Netherlands. The Brisbane repository does not contain a mirror for ProM 6.8, so this will not work for ProM 6.8. Before i run the Prom Nightly Build, should I install ProM6.8 first? And i change the following line in ProM.ini from ProM-nightly-YYYYMMDD-1.X.tar file,not from ProM6.8 file. Sorry, I don't understand the second step of this installation tutorial. 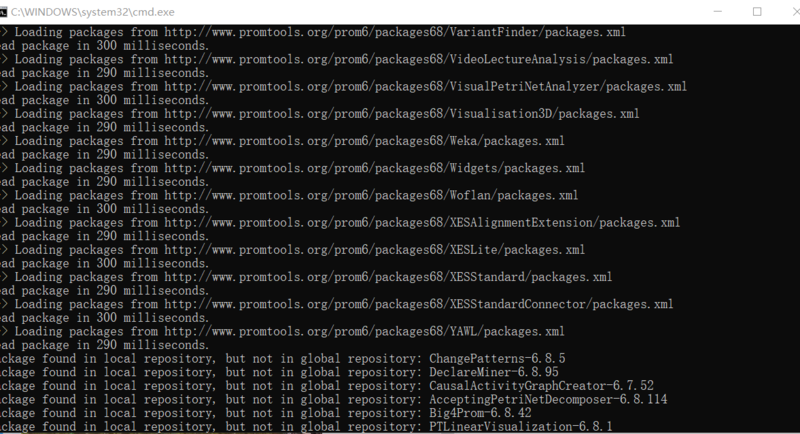 In addition, when i install the ProM6.8 again, i run the ProMPM68.bat, this prompt will appear：“Package found in local repository, but not in global repository: ChangePatterns-6.8.5”. Is that right? I'm sorry to trouble you so many times. If I still can't work this time, I think I can only use The Discover. ProM 6.8 and Prom Nightly Build can be run next to another. There is no reason to install or uninstall ProM 6.8 first. You need to change the ProM.ini file from the Nightly Build, not the one from ProM 6.8. That will not work. You have downloaded, say, today's Nightly Build, that is, the file ProM-nightly-20190214-1.7.tar.gz. If you extract the contents from that archive, it will create a ProM-nightly-20190214-1.7.tar file, that is, it will gunzip the archive. If you now extract the contents of the gunzipped ProM-nightly-20190214-1.7.tar file, it will create a folder named ProM-nightly-20190214-1.7 containing all files for the ProM Nightly Build. This folder contains the ProM.ini file that you need to change, and the ProM.bat file that you need to run. Does the prompt always appear for the same packages? My guess would be that it is not, that if you run ProM for a second time, other packages may be listed. Version 6.8.5 of the ChangePatterns package is definitely in the global repository of ProM 6.8, so I assume that ProM was unable to download the descriptor file for this package, and also for the other packages with similar problems. This tells ProM not to check the packages when starting. As shown in the following figure, when i got the folder named ProM-nightly-20190215-1.7 containing all files for the ProM Nightly Build. I changed the ProM.ini file and run the PackageManager.bat file and the ProM.bat file, but it didnt work. When I double-click on the file, the same black box(C:\WINDOWS\system32\cmd.exe) appears as before, but disappears in less than a second, and then nothing opens. God, did I make a silly mistake? Is this software only available on LINKS systems? My computer system is Win10. And all of the computer systems in our lab are Windows. Maybe our lab's Windows system is incompatible with ProM6.So when I installed ProM before, there was always an error. Is it possible that my windows system and ProM conflict? Should i try LINKS or MAC instead. I'm so sorry to trouble you all the time. It should work on W10, we use it here on W10. Our default platform is Windows. The advantage of this is that the command prompt will not disappear when an error occurs. As a result, you can see what's wrong. If needed, post the contents of the command prompt here, and I'll have a look. It still dont work by this way, the same phenomenon has occurred. When an error occurs during installation and it can't download the installation package, but I can access the URL to download the installation package. This may mean that the server has blocked our java program. Because the server's security settings do not accept Java programs as client access. I am thinking about resetting my computer's User Agent, which may be useful.